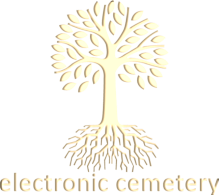 "Environmentally Minded Electronic Waste Management"
Congratulations, you've found our website. That means you've done the right thing and are on your way to a cleaner lifestyle! 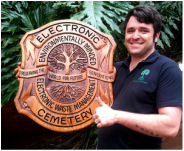 Electronic Cemetery is an environmentally minded e-Waste management company certified with eWasa (e-Waste Association of South Africa), SAEWA (South African e-Waste Association) affiliates and registered with the Department of Environmental Affairs. We aim to prevent as much toxic electronic waste as possible from entering landfills and poisoning the Earth. We do this by breaking down redundant equipment into their various components, salvaging metals and recycling all possible materials, as well as refurbishment and distribution of reclaimed equipment. This affords disadvantaged communities access to computer equipment as well as allow us to make frequent donations to charities, students and such deserving people. Connecting, uplifting and creating opportunities for growth has always been our main mission. How can you schedule your collection? Either pop us an email, fill in the contact form, send us a message on our Facebook page or give us a ring on 0793477063 and we will be in touch with you right away to answer any questions or queries you may have. You can also watch our short video for more info.